The fish suggested here is whiting, which is from the same family as cod but cheaper – if it’s not available, use cod or pollack or any other white fish. This is an easy midweek meal. Mix together the soy sauce, mirin, honey and ginger. Pour into a shallow dish and add the fish. Marinate in the fridge for 15 minutes, turning the fish over after 10 minutes. Preheat the oven to 200°C, gas mark 6. Heat the groundnut oil in a large frying pan, add the fish fillets (reserving the marinade), and cook for 3 minutes each side. Place the fish in a shallow roasting tin, pour the marinade over and place in the oven for 10 minutes. Meanwhile, bring a large pan of water to a rolling boil then add the noodles. Place a colander over the noodle pan and add the pak choi and salad onions. Cover, remove from the heat and leave for 5 minutes or until tender. Drain the noodles, return them to the pan and add the steamed pak choi, salad onions and the sesame oil. Toss gently. 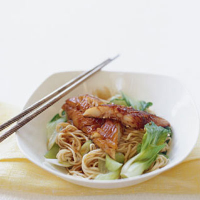 Serve the fish and any marinade sauce with the pak choi noodles. it marinating for longer than 15 minutes or it may start to become tough. Why not try steaming some mangetout alongside the pak choi as an added vegetable? Waitrose Italian Organic Bianco Moncaro, Marche, Italy, is made from a blend of organically grown Verdicchio and Trebbiano grapes. It’s deliciously fresh, and perfect with fish.